Soak in panoramic views of New Zealand's South Island during your 35-minute one-way flight to Queenstown from the Milford Sound. The scenic flight follows a route over Fiordland National Park, the Southern Alps, Lake Wakatipu, and Sutherland Falls, before landing at Queenstown airport, where a driver transfers you to your hotel. Milford Sound Aerodrome, or if you wish your pilot can meet you at the Milford Sound Cruise Terminal. Confirm your flight's departure (which depends on the day's weather) by calling ahead before your flight. 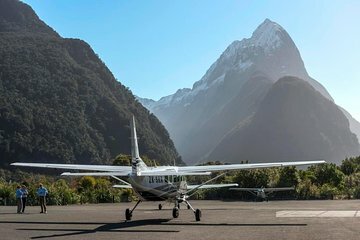 Once confirmed, make your own way to the Milford Sound Airport to board your small airplane. Take the scenic route to Queenstown when you glide over the majestic landscape of Fiordland National Park. Capture aerial photos of snow-capped mountains, sparkling fjords, and alpine lakes, and see features such as the Tasman Sea, Southern Alps, Lake Wakatipu, and Sutherland Falls. Touch down at Queenstown Airport and disembark from your aircraft. Transfer to the waiting vehicle for transportation to your hotel in Queenstown where your tour ends.